Golden Retriever Puppies and Dogs | Golden Retriever Savvy " "
If you’ve ever seen a commercial that features an adorable puffy puppy that looks like the dog version of a lion cub, then you know how sweet Golden Retriever puppies look. However, just because all puppies are sweet, doesn’t mean they’ll grow up to be an adult Golden with all of the breed’s favorable characteristics. Thus, the following is a look at the breed standard to give you an idea of what to look for when selecting Golden Retriever puppies. Goldens have a broad skull and a large head that is well defined. The muzzle, which is strong, deep and wide, should smoothly blend into the head of the Golden puppy. The ears are a medium size, and should be just above the eyes and fold comfortably to rest closely to the cheek. Check inside the ears of your Golden puppy. Healthy ears will have a pale pink appearance and have no foul odor. The eyes of Golden Retriever puppies are a deep brown and are set well apart. The rims of their eyes should be black. The eyes should be clear and have an intelligent and friendly look. The Golden’s sclera should be white not yellow, and there shouldn’t be any discharge or fluid coming from the eye. A Golden should have a wide black nose with well developed nostrils. The nose should be clean and have no discharge coming from it. The Golden Retriever has strong Jaws and a perfect scissor bite. Their upper teeth closely overlap the bottom and are set square to the jaw. Teeth should be white. Golden Retriever puppies have about 18 fewer teeth then adults, which they will lose when their permanent teeth grow in. Their cheeks are slim. The Golden Retriever has a strong build that gives him an attractive appearance as an adult. Their chest is strong and they have deep ribs that are well sprung. Goldens have very balanced bodies (although they may not appear to be very balanced as puppies). Their back is strong and level from the withers to the backend. The tail of a Golden Retriever is carried level with the back or is slightly upturned. It should not curl at the tip or hang downwards. The tail is well feathered when the Golden is an adult, and is one of its dominant features. The forelegs are straight and are designed with a good bone structure. The elbows are close fitting and the legs are placed well under the body. The hind legs have plenty of muscle and the stifles are well bent. The hind legs should look straight when you view the dog from behind. The feet of a Golden are very round, compact and well knuckled. They have thick pads to serve them well both on land and in water. The paws of a Golden Retriever puppy are one of their most distinguishing features, as they are often compared to lion cub paws. Golden Retrievers have a long, balanced stride that is carefree. Before you settle on a puppy, observe his walk. While his walk may not be perfectly balanced due to his youth and growing state, the purpose is to see if he is favoring a leg or any of his paws. The coat of a Golden Retriever is not course, nor is it silky. The coat of an adult is moderately long and lies close to the body. It is either straight or has a slight wave. The coat is not curly, and is resilient, water resistant, and firm. A healthy coat will appear glossy and will not have any missing patches of hair, look spotted or soiled. The coloring of a Golden Retriever is his trademark. 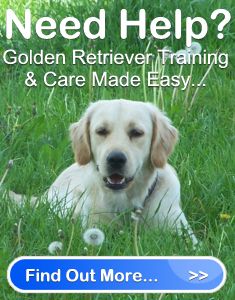 Goldens are available in different shades of gold. Golden Retriever puppies tend to have light coats that appear tan or almost white in color. Their coats will darken with age.